I knew before I got back to the cabin after My Jungle Trek that I would be looking for a deeper adventure. That feeling of self-satisfaction of "just doing it" felt pretty good. This was in comparison to my usual winters in Virginia where walking from one end of the house to the other was a challenge with the rheumatoid arthritis. How could I pass up the opportunity to live life more fully when I had come all the way to Costa Rica to get ahead of the disease? Another adventure was just what the "doctor" ordered. I had noticed the swamp areas on the map and wondered about them. With each step forward against my fears, I found renewed ability to take another more challenging option. My desire for this solo trip to Costa Rica was to improve myself physically, spiritually and mentally, so I didn't want to pass up any opportunity that might be the stepping stone over a stronghold in my life. I was determined to go where I had never gone before with the hope that my brain would take notice and choose to believe something new and better. When I left the cabin for the trail that included the swamp, my mind was set and totally consumed with the event itself, so I was about 500 meters (about 1/3 mile) into the trail before realizing I did not put boots on. If any trail I had been on needed boots, not only for snakes, but for the mud, this would be the one. Especially after several days of rain. Oh well, I wasn't turning back now. After all, the jungle trek had some pretty rough spots but there were concrete stepping stones to help make it through. Surely there would be something similar. There was, or shall I say, had been, since the concrete was now sunk into the mud. 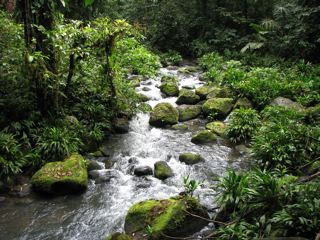 I thought swamp meant lowlands, picturing flat, but although La Selva is considered to be in the Caribbean lowlands of Costa Rica with an elevation of 115 feet, My Jungle Trek had plenty of steep hills. Well, I was too far out to turn around now. I was determined to make it through this part of the trail and back into the paved connection. The sight of the path before me made me well aware that I was going to be in the mud. It turned out there was almost a mile of mud till I reached that paved trail. The photographer in me was thinking photo journal of this adventure, while good reasoning told me that I was not going to make it through this entire trail standing up, so wisely I decided to put the camera in the fanny pack camera bag. As I proceeded to navigate the trail, I realized there would've been no safe place to firmly stand to take photos. It's a general rule that you don't reach out to grab trees or vines to break a fall because there are all kinds of poisonous things in the jungle that can be absorbed through skin from a plant, or that vine may not be a vine after all. Many insects and reptiles exude "defensive liquids" that are toxic, so up to this time I had followed this rule. Staying on the trail and not stepping into the forest was another rule since there's so much density and darkness, that you can't really tell what you're stepping in or near. I had no problem following this rule either since I was more than happy not to venture off the paths. Besides, it wasn't like you could just step between plants and trees ... there's really no "between" in the jungle. There are vines and undergrowth everywhere. So, with all of that firmly fixed in my mind, I headed down the first hill and found my bottom soon sunk in mud, along with my binoculars, an elbow and one hand. Thank goodness my fanny pack placed in the front was totally clean. My elbow must've caught something sharp on the way down since it had a two-inch cut, but since it was covered with a thin layer of mud, I didn't have to worry about it bleeding. I did wonder if the soil carried diseases similar to malaria. How the mind wanders with silly questions! Where were the wet wipes when you need them? Actually I had two napkins in my camera bag. As I unzipped it with my clean hand, I realized that once I wiped off the mud, I had nowhere to put the napkins, so I abandoned that thought. The mud would dry and could be washed off later. For now ... it was finishing this chosen adventure that my mind needed to focus on. Surely the entire .8 mile couldn't be this bad. The thought was hopeful and comforting for a little while but the wishful thinking didn't last long. My thoughts were now centered on getting out of this swamp without my camera bag hitting the mud. All rules were now tossed. I could no longer look ahead or around for snakes. I grabbed anything I could to stay afloat and took any inch of ground I could grab on the edge of the forest for a foothold. I scrambled across huge fallen trees on hands and feet hoping not to find two beady eyes peering up at me from the other side. I didn't care about my shoes being two inches deep in mud, I just wanted to keep them both sole down on the trail. Each step required a decision on where to place my foot and with each step I sent up a prayer. No, it wasn't "If you get me out of here I'll _______ forever more." A prayer for guidance for hands and feet and maybe a bit more sensibility when I got finished with this crazy idea. Swamps are known to be hot and steamy and I sure felt the heat. Maybe just because I was "sweating it out" to the end of the trail. As I became more soggy it got more and more difficult to see. My face was mostly facing downward, so the sweat from the sides of my forehead was running into my eyes, making them feel like they were filled with burning tears. Blood, Sweat and Tears came to mind. I think it was the name of a rock group in the 60's or 70's, but the thought served up a giggle to make the moment a bit lighter. If I'd been a bit more human, and a lot less determined in the task, I would've sat down and had a good cry, but there was no time on my agenda for that. I pictured a cold shower with mud flowing down the drain and I was headed for the reality of it. When the trail finally leveled out there was a turn ahead and I could see the end of a bridge. I hoped that the other side of the bridge had pavement, so with my mind on that, I almost fell backwards when I stepped on the bridge to find the most beautiful river scene I've ever viewed. There have been many rivers in Tennessee that have held my attention for hours, but loving the rainforest as I do, this was a picture of Heaven since I believe rainforest is what the Garden of Eden was. This was my reward! I would forever connect the challenge of the swamp hike with the cherished view of this scene. However, my hot, soggy and muddy body still longed for clean and cool, so I took some photos from the sturdy bridge and moved on knowing I could return on another day to truly enjoy this gift. The paved trail returned and I picked up my pace headed for the cabin. My binoculars cleaned up fine and so did I. I put Tea Tree Oil on my cut, took some Herbal Potassium to replace the minerals lost from sweating, and drank some Silver Shield to be certain that anything that may have entered my bloodstream would be dead by evening. As for me, I felt so alive!